On the crisis spawned by the earthquake-&-tsunami-stricken Fukushima Daiichi power plant in Japan, the UN has reported “some improvements”, but warned that the overall situation remains very serious. Japan’s Health Ministry also said that drastic radioactive materials have been found in 11 types of vegetable grown in Fukushima Prefecture, including broccoli and cabbage. If a person eats 100 gms of the vegetable with the largest detected amount of radioactive materials for about 10 days, it would be equal to ingesting half the amount of radiation a person typically receives from the natural environment in a year. “High levels of contamination have been measured in the locality of the plant… The highest concern remains the spent fuel in the storage ponds of each reactor unit, particularly unit four,” International Atomic Energy Agency Special Adviser on Scientific and Technical Affairs Graham Andrew told newsmen in Vienna. 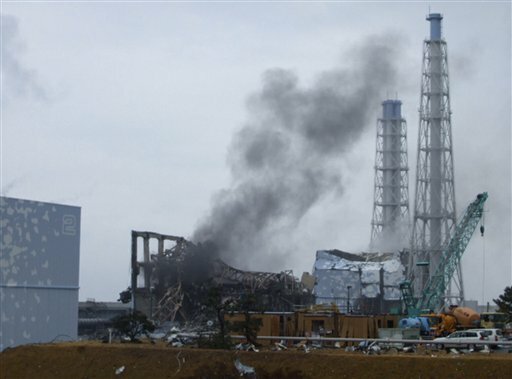 In this photo released by Tokyo Electric Power Co., gray smoke rises from Unit 3 of the tsunami-stricken Fukushima Dai-ichi nuclear power plant in Okumamachi, Fukushima Prefecture, Japan, Monday, March 21, 2011. At left is Unit 2 and at right is Unit 4. Japanese emergency workers are racing to restore water cooling systems to prevent a total meltdown of the fuel rods and a major release of radioactive plumes in the worst civilian nuclear crisis since the deadly Chernobyl power plant explosion in the then Soviet Union 25 years ago. They have pumped in sea water, sprayed additional water from helicopters, and have now reconnected electricity power that was knocked out by the quake. On the ground in Japan, the UN World Food Programme has launched a logistics operation to support the Government’s delivery of relief items to victims of the devastating 11 March quake and tsunami, which killed some 10,000 people, with a further 13,000 still missing. Experts are helping to move relief items swiftly to the areas that were laid waste by the enormous waves, where some 350,000 people are estimated to be staying in 2,100 shelters.